Hundreds of years ago Apple put out the Macintosh. The device at that time was considered revolutionary. It was an all in one machine with a keyboard and... and! a thing called a mouse. I know that sounds about as exciting now as having two windows open on your screen at once, but back in 1754 that was mind bending. In the years that followed old Mac moved into dominating the creative arts like design and video editing (kinda) and, well, that's about it. I think somewhere in there they buried themselves in that and Microsoft took advantage and became a tool that just did what people wanted to do at the time. Which was play solitaire and write term papers with Word Perfect (because it had spell check). Flash forward to modern times, if you will. Apple is still riding off that innovation steam of yesteryear pushing products that make nice what others have done. I don't see this as a bad thing. They do it very well. These days it's easy to see in hindsight that OSX changed the game. That the iPod and iPhone and iTunes thump the competition. But they aren't anything like the invention of the mouse. What is, I suppose. The iPad, to me, is a giant iPod Touch. That's pretty neat. I think it fits into the lives of people who believe that connectivity in the home should be as abundant of throw pillows. It's clearly not made for any specific industry or work place (although functionality can be found there). It's not a book reader. It can't do things a student would need it for in class. I'm just having a hard time finding a place for it. I mean, I like the idea of a tablet with bright colors. It does seem like some sort of future device. However, in 1993 the MessagePad appeared like it was as well. Don't remember that one? Neither did I till I looked it up. In some regard you could see that as a precursor to the iPhone. Maybe it was... or maybe it was just a thing that inspired a line of Palm Pilots. Perhaps technology is passing me by. I dunno. What I see is Apple cashing in for the time being and turning it into an OSX machine down the road (with a camera facing forward, but then again, who cares). In a way, it's smart. But in another way, it makes it seem just plain useless. I like the direction of the iPad just like I could see liking the direction of the Macintosh Portable back in '83. Would I have purchased that monster? No. But did it inspire the laptop to what it is now? Yup. Boy, would I have liked to have seen that Apple fan at work back in 1983 whipping out that 16 pound portable on the conference room table. "I waited in line for 10 hours to get this sweet machine!" 16 pounds. Who can sell a portable anything at 16 pounds? 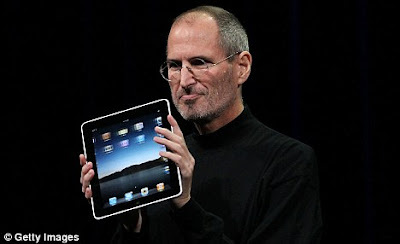 Steve Jobs, that's who. Wow, this post is going back and forth and up and down. I'll finish it off with this then... Apple. Innovators and great salesmen, Hot Tub Time Machine looks awesome and I want to play Mass Effect 2.